Okay, der Skylynx ist ein Must-Have für die Sammlung. Jetzt haben wir das Panel vom Transformers Collectors Club auf der Bozcon 2015. Der Dank geht hier an allspark.com. 22:43 1st question was just thanking the FP crew. 22:41 There has been discussion, but they're not fitting at this time (specifically Jhiaxus). 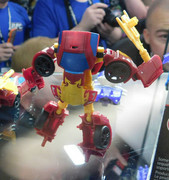 22:41 Any chance for a G2 colored Jhiaxus? Or human form Springer and Ultra Magnus? 22:40 Survey is the best feedback. They may look into having some online too if they need to. 22:39 What is the determiner for the month that the convention is held? It depends on different situations. Try to have their two shows in Spring and Summer (Joe Con and BotCon). 22:39 Tapout was a proposed exclusive a few times, but was changed due to various reasons. 22:38 Pete - not saying anything either way, but they have a lot of options and will do something if it makes sense. Like TM Fractyl, keeps on showing up but ends up getting pushed off for various reasons for example. 22:37 Can Fun Pub release some more 3H characters? 22:37 Fill out the feedback forms as they look to that for ideas and feedback. 22:36 Pete is on the forums and pays attention to what people want. 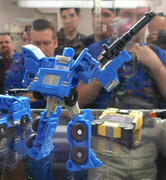 Battletrap was a no brainer to them based on people's feedback on the forums. 22:35 Any change for G2 Combiner Wars (specifically unreleased G2)? Pete - they work closely with John Warden, so they have to pick and choose what they do. Taking into consideration demand at the Club / BotCon price, etc. 22:34 Will registration be on time? Hopefully. They are looking to separate from the current company, and are looking to get away from their current company. Sites might go down while they transition to other companies. Shouldn't have more than one piece of software with more than one place. 22:32 Licensed vehicles are off the table, but everything else is pretty much in game and in flux. They work closely with John Warden, who also gives suggestions on ideas for the Club. John loved the Mayhem guys. 22:32 Any plans for a Transformers Victory Combiner? Possibly. But that's not on their plans as there are a lot of opportunities they can explore for Combiner Wars. Fun Pub is working really closely with them, and even closer tie-in's now than before. There are things that are aren't necessarily fitting in (like Skywarp & Ramjet), but others that do. Things are always in flux and could always change. 22:30 Club Store Shipping. Questioning about excess shipping. 22:28 Pete - it'd be nuts to create the figure and never release that? 22:28Pete - it'd be nuts to create the figure and never release that? 22:28 Will we see the alternate color scheme for Oilmaster come out? 22:27 Depends on what Hasbro's doing and if they can compliment them as well as not repeat what they're doing. 22:27 Rotorstorm a possibility? Can't speak to specifics, but possibly. 22:27 Might not be right now, but stay tuned. 22:27 They do know Beast Wars are popular. Pete - there might be some coming soon. 22:26Will the club do more Beast Wars (Days of Future Past or Uprising)? 22:23Location for BotCon is determined based on a number of things. 22:22 Handing out exclusive cards to panel attendees. 22:21Hasbro allowed Fun Pub to use Onslaught early because of them working closer together. 22:21Size class for 4.0 freebie is a Deluxe. They worked with Hasbro with the freebie. 22:20There will be a bonus 7th figure again (that will be a mystery). 22:20 There will be a 6th figure, because of some changes they can't show but plan on showing it in the next month. 22:19Will have deco like inner robot, uses CW Onslaught. 22:19 Bludgeon from Onslaught!!!! New robot mode head. Mayhem Maximus! 22:19 Spinister from Alpha Bravo with Scoop's 2 Targetmasters as his own. 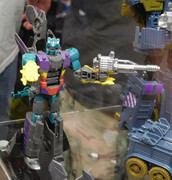 Needlenose from Firefly also with 2 Targetmasters. 22:18 2nd figure from #3 will ship when they get back. Ordering for #4 will begin in mid-August. 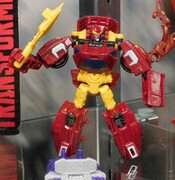 22:17Transformers Figure Subscription Service #4 preview. 22:16Skywarp and Ramjet will have a new head. 22:16Will be carded on Joe style cards but will be Transformers themed. 22:15Human Rodimus and Arcee G.I. Joe figures! 22:15Skywarp as 2016 Exclusive #1!!!!!!!!! 22:14 TCC Free Membership member is Universe Ramjet from Armada STarscream with new head! 22:14As well as Marissa and Afterbreaker. And shows the the 3 pack and 2 pack on card. As well as samples on hand in package. 22:13Shwoing card for Old Snake and BAT. 22:13Have samples of Marissa, Afterbreaker, Old Snake, and BAT up at the table. 22:13Stealth BATs is the name of the Soundwave BAT. 22:12Talking about future exclusives in 2015. 22:11Talking about how Scoop was a great choice for Sgt. Hound and Roadbuster had a head that resembled General Optimus and it was perfect timing. Burnout and Lift Ticket (previously named Salvage). 22:09Lanny explaining the deco sheets. 22:08Deco sheet for Oilmaster Swerve & Flanker. 22:07Tried to take cues from the original but uses modern aesthetics. 22:07Try to one up Scorponok with Oilmaster. Had to remain in the price range for the set. Pretender was doable because it's simpler than a normal Transformer. 22:06History of Ape Double Pretender. 22:05Resin head sculpts for Megatron and Battletrap. 22:04BotCon 2015 box set art. 22:03TCC Roundtable starting. Brian Savage, Lanny Lanthem, and Pete Sinclair. Die meisten Figuren waren ja eigentlich zu erwarten. Aber ich hätte nicht gedacht das wir Hasbro Sky Lynx bekommen. Sogar noch bevor sich eine 3rd Party daran versucht hat. Und dan auch noch als Combiner. Bin dan auch mal gespannt als welchen Charakter sie den repainten. Vielleicht Hun-Gurrr? Der Legend Class Shockwave für Bruticus ist auch eine nette G1 Cartoon Anspielung. Hier haben wir jetzt die Bilder von der TFCC Ausstellung auf der Botcon 2015. 23:43 As a voice actor, who inspires you? Everything and everybody, nothing really specific. Says "that" inspires him, as he points to the audience. 23:42 Says Jim Davis of Garfield was very nice and rspectful and good to work with. Then he gives a "Scooby dooby Doo!" 23:41 He's doing some Garfield stuff, which he'd like to do more of but it takes so much energy. Gives a quick impression of Garfield. 23:41 Curious George is my children's favorite character of yours, what kind of curious adventures would he get in the TF universe? In Megatron voice, "Who's been monkeying around with Soundwave's controls?" Curious George squeaking. As Soundwave's, "I'll take care of it." Monkey squak that very abruptly stops. Funny bit! 23:39 About the typical " how do I get into voice acting?" question, has anyone ever come to him years later after getting advice from him about it? Howie Mandell is a wonderful, funny, comedic genius, but he worked with him on "Laugh Track" which was very low budget and Howie would do really funny voices. Frank said he should do voice work, and recommended him for some voice work. As a result, Howie got Gizmo in "Gremlins." Even today sometimes Howie will say that one of the great things in his career is that Frank Welker got him into voice acting. Howie also did his own cartoon "Bobby's World," and he called Frank to do the role of the dog. 23:36 It's awe-inspiring for him that something he did 30 years ago means so much to people, and he's thankful that it lives on and means so much to him too. 23:36 What is it like to voice one of pop culture's most infamous villains. In Megatron voice, says "Absolutely wonderful." 23:35 giving credit and thanks to his agent. 23:35 May we hear your impression of Peter Cullen's Optimus Prime. "That's very dangerous. I may be stupid, but I'm not crazy. I may have to pass on it." He does a very very heavy, deep, gravelly "Transform and roll out." 23:34 When you take on a voice for Steven Spielberg like on Tiny Toons, do you get materials from him or research about it? No, but he started to be very careful with Mr. Spielberg, he wanted it to be just right for Mr. Spielberg. But just saw a few interviews, and heard from Spielberg that he enjoyed the impression. 23:32 Do you have any anecdotes about working with Chris Latta? Chris was amazing, he worked so hard, so fast, and so intense that he would perspire profusely and they would always see who had to stand next to him in the session. He had so much energy you could feel the energy coming from him. He never left anything, and was a treat to work with. 23:31 What was your inspiration for the voice of Rumble and can you give an example? Talking as Rumble, he's saying it came from making Rumble a dead-end kid from the James Cagney type days. 23:30 Many VA's have told the story of him doing a pay phone gag during a break. Is that true and can you recreate that? "No, and yes." Doing a quick bit as talking on a payphone that's really pretty good! 23:29 How was the TF4 experience compared to other TF experiences. Checks with his agent at the side of the room quick to see he can tell this story. Got a call about doing a "special character" audition. Found out after he got there and found he was working with Michael Bay on it. Does a quick vocal back-and-forth between Megatron and Galvatron. 23:28 Please tell us the story of stealing Peter Cullen's steak dinner. "No. I did steal his parking space once." 23:27 he does a quick funny sound check of the mic, imitating some boops. 23:27They get the scripts, sit down, and read it like a play, which is kind of fun sometimes. 23:26 How much of a story do you get to know about beforehand? It varies. Normally if they do get a script ahead of time, they don't read it. They get to the session and find there's so much directing, that if there' sore conception he has to fight through those feelings for what the director wants to do. 23:25 Other than the technology involved, how has voice acting changed for you? Animation in the G1 days and the story were faster. Now they're slower and take more time and concentrate more on story and subtlety, as well as for having story arcs. Today more emphasis on story, as well as with the effects and animation. 23:23Is there any character you've not played that you've always wanted to? You can be so many different things in the voice business. He's acting out being a baby. Now being a teenager. Now a dad. Now a grandpa. So with enough range, you wait long enough and the part comes along. He's loved it all. 23:22also watched his German Shepherd to figure them out. 23:21Where do you draw inspiration for the many animal voices? From the animals themselves, hung out at the zoo to prepare for Raiders of the Lost Ark. Now he's doing a monkey impression. It's awesome! 23:20Have you enjoyed coming back to do the voice of Megatron, and have there been difficulties? No difficulties, love doing his voice for a lot of years, and thanks friends at Hasbro for letting him do it. It's a voice like riding a bicycle, uses Megatron voice to say "I always enjoyed doing it." 23:19Recently did a movie with KISS. Says those guys are amazing and had so much fun doing that, especially with the Scooby Doo characters. 23:17Name-checks Peter Cullen as an inspiration, too. 23:17Frank loved Bullwinkle growing up, and had a chance to work with Bill Scott later to play some of those characters. That was a huge inspiration for Frank. 23:16what's the most fun type of character to play. He's played everything from dogs and cats to dads, but a role like Megatron comes along and it's so fun because it' so different from what else he's been doing. 23:15Does the Megatron voice to answer "Are you an Autobot or Decepticon." Todaro does a Starscrea m voice to which Welker responds "Decepticon." 23:14questions being asked by Frank Todaro, were submitted previously and hand-picked rather than being open wide. 23:14he appreciates how everyone who he did an autograph or took a picture for said "thank you"
23:14 Frank just came in the room to standing ovation and applause. He,s thanking us for being so gracious to him. Acknowledges it's his first Botcon. 23:12Frank Todaro is introducing Frank Welker. He's basically saying that if you had a childhood, you know Frank Welker. 23:12Frank Welker panel is about to start. What happens when Curious George, Megatron, and Soundwave get together? Only one person can answer that question, and his name is Frank Welker... Enjoy this little snippet, there plenty more where that came from! 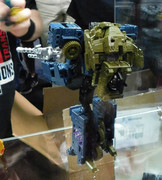 Stay tuned to Unicron.com for more by-the-minute coverage of all things transformers! Hier haben wir weitere Bilder aus der Ausstellung von der Botcon 2015. Wie bestellen Arcee und Blurr in einem Drive In? Hier haben wir das Panel von Art of Transformers auf der Botcon 2015. 18:58 Casey says he has fewer funny bits, more tragic. Sarcastically, "It was funny when they made me redraw half an issue, hilarious." And Robbie once drew an issue with Skywarp as F15 when he should have been an F22 and had to edit that in Photoshop, just because that was so ingrained. 18:57 Josh B says craziest thing is getting to know the other guys. 18:57 Do you have any funny stories? 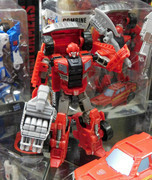 Josh P was in college when working for Dreamwave and there was an Energon issue of Tidal Wave vs. Ironhide that he had to do at the same time as his finals. He took some caffeine pills and on the mark of the 3rd day they started to affect him to the point he was putting salt in coffee. After finishing all the work, he was watching TV and after a while someone told him the TV was off the whole time. 18:55Josh P also says the hardest part is not falling in love with the other guys! 18:54What do you find is the most challenging part of your job? Deadlines. Casey says it's his own obsession for detail. Josh B agrees it's battle between deadlines and wanting artistic perfection. Josh P thinks this is also a positive thing because you have to learn to accept your flaws a little bit more. Robbie agrees with that balance. 18:52How much freedom do we have to the art interpretations? Robbie says we have some degree of interpretation, but tried to stick with EJ Su design at the time, but were generally given free reign of how to design a new character unless it would drastically change a look. Josh P gets a lot of freedom, especially with generics in the background, but you usually can't alter much from the artist design. Josh B says IDW is cool with then putting out what they want that creates the best product in the end. Casey says it's rare to have to be reigned in, but he would try and do unique panel layouts, but once got told to do simple boxes. 18:48Who is the first character you drew officially and unofficially? Casey unofficially no idea because of being a kid, tracing around a toy on a piece of paper to color in. Professionally drew Megatron first with the Reflector "Killing Joke" cover. Josh B has been drawing since he could pick up a pencil so can't remember unprofessionally, also can't remember first drawn character professionally, but remembers coloring Armada profile books and Jetfire first a a pro. Josh P also has drawn since he was spawned and can't remember the first one, but remembers a Galvatron mug he would draw because he liked it, but also remembers first pro drawing was SG Steeljaw for FunPub and also Wheeljack was the first one colored. 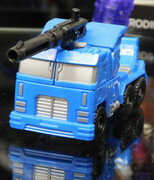 Robbie probably thinks it may have been Soundwave first ever, and the first pro work was the Ultra Magnus cover. 18:45What's your favorite character to draw, and who's your comic art inspiration? Robbie's favorites are g1 characters, and he's been inspired by cartoon. Josh P favorite is Bunblebee because of personal connection, or anyone with a fun shape/silhouette. Working with Derrick a lot and have gotten a lot of inspiration. Josh B likes Optimus or anyone with a faceplate, and he's inspired by Geoff Senior and Derrick or Scotty Young. Casey's favorite is Jazz because he likes guys with faces and distinct personalities, and is influenced by all the guys that work in TFs especially with first name of Josh, but really try and steal a little from everyone because they all bring something to the table. Also Wildman and Senior, or Jim Lee and Todd McFarlane or Liedeld as a kid, or Rizzo of 100 Bullets or Batman stuff, Brian Hitch. 18:40 Is there more pressure to get comics done faster today, and does it affect how you work? Josh P says TFs popularity being so high makes a push to tell more stories, because you want to tell more and get them out faster. Josh B and Casey agree there isn't necessarily more pressure, but having to finish some work before designs are finalized can be difficult. 18:38What do you color with, and how long does it take to color a page? Robbie works in Photoshop on a tablet. Josh P uses Photoshop CS5 with Bamboo tablet. Josh B uses Photoshop CS and a cintiq, and it takes about 4-5 hrs per page. 18:36What has been your favorite thing to work on in the past year? 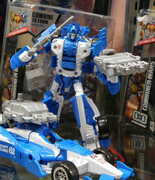 Robbie's was the Spotlight Ultra Magnus comic, also Bot Shots and Angry Birds TF. Josh P. Liked the script reading work. Josh B. liked the Timelines book and subscription characters. Casey thought the Combiner Wars covers were great to work on. 18:34How do you get to work as an artist? Robbie says to start young, keep drawing, don't quit or get discouraged, share your art online and don't be afraid to show it and accept critique. After you establish a portfolio, go to conventions and show it to others in the industry. 18:33Robby Musso, Josh Perez, Josh Bertrum, Casey Collier are here on the panel. 18:14The auditions are running over, so the art panel should start soon. Schade das es ein paar der wirklich guten Repaints nur vom Transformers Collectors Club gibt. Hier haben wir ein Interview zum einem Designer Team von Hasbro auf der Botcon 2015. Es geht um Transformers Generations und Robots in Disguise.